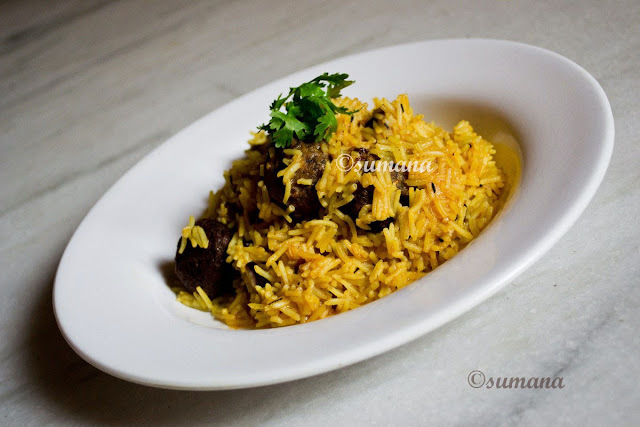 This Pulao with koftas made from banana flower (also known as Mocha or Kele Ka Phool) is a delicious vegan whole meal. The dish itself is very easy to cook and does not take much time, but making the banana flower ready to cook is a time consuming job. Kofta: Take a mixing bowl and mix all ingredients of kofta except gram flour. Mix it very well and now add gram flour as you need because this is used for binding. Now mix it and divide to make 12 balls. Heat oil in a pan and fry the koftas till brown. Pulao: Heat oil in wok and put bay leaf, caraway seeds, whole cinnamon, green cardamom and cloves. After 1 minute, when the spices start spluttering add ginger paste and after that add tomato puree and stir well. After 2-3 minutes add soaked rice and stir it and fry for 2 minutes. Now add salt, garam masala powder and 3 cup water and cover it. `After 10 minutes, when rice is done, add sugar and mix it. Now add mace-nutmeg powder and koftas and mix it very lightly. Now add ghee and cover it for 2 minutes. Your banana flower kofta pulao is now ready. Serve it hot.